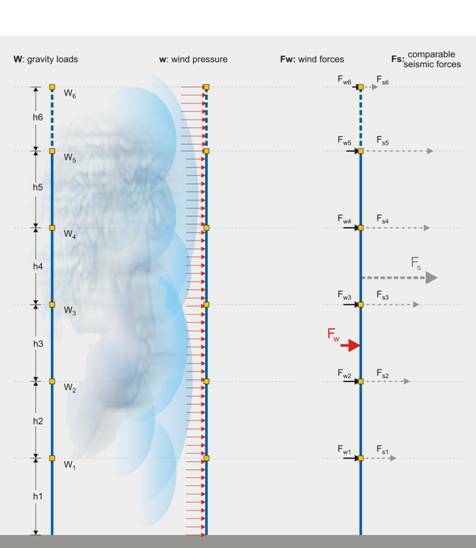 In the same structure, when placed in a geographical region with intense winds, the mean value of the wind pressure is around 1.50 kN/m² and the resultant force around 400 kN. The total service load applied is 12.000 kN. Therefore the wind force is equal to 0.03% of the vertical loads and its theoretical application area is in the middle of the structure’s height. Comparing the wind and the seismic forces applied to that structure we realize that the wind effect upon the structure is at least four times smaller than the seismic effect. Reinforced concrete structures have large self weight both during the design and the service life, consequently wind loading does not affect their behavior to the same degree as it affects timber or steel structures. In the design of earthquake resistant structures we consider either seismic or wind forces and not simultaneous loading. As a rule, the seismic action that applies a load analogous to the wind pressures has a greater value than the wind loading, consequently, in seismic design, structures are not calculated for wind pressures. In Greece the effect of wind is significantly smaller compared to the effect of earthquake motions even in the Zone with the lowest seismic activity.